Experience and data from the Good Judgment Project (GJP) provide important evidence about how to make accurate predictions. For a concise summary of the evidence and what we learn from it, see this page. For a review of Superforecasting, the popular book written on the subject, see this blog. GJP made their official predictions by aggregating and extremizing the predictions of their volunteers.5 They identified the top 2% of predictors in their pool of volunteers each year, dubbing them “superforecasters,” and put them on teams in the next year so they could collaborate on special forums. They also experimented with a prediction market, and they did a RCT to test the effect of a one-hour training module on forecasting ability. The module included content about probabilistic reasoning, using the outside view, avoiding biases, and more. Attempts were made to find out which parts of the training were most helpful—see Section 4. Way One: Let’s calculate some examples of prediction patterns that would give you Brier scores like those mentioned above. Suppose you make a bunch of predictions with 80% confidence and you are correct 80% of the time. Then your Brier score would be 0.32, roughly middle of the pack in this tournament. If instead it was 93% confidence correct 93% of the time, your Brier score would be 0.132, very close to the best superforecasters and to GJP’s aggregated forecasts.14 In these examples, you are perfectly calibrated, which helps your score—more realistically you would be imperfectly calibrated and thus would need to be right even more often to get those scores. The data from this tournament is useful in two ways: It helps us decide whose predictions to trust, and it helps us make better predictions ourselves. This section will focus on which kinds of people and practices best correlate with success—information which is relevant to both goals. Section 4 will cover the training experiment, which helps to address causation vs. correlation worries. Figure 3. Structural equation model with standardized coefficients. This model has a multiple correlation of 0.64.23 Earlier, we noted that superforecasters typically remained superforecasters (i.e. in the top 2%), proving that their success wasn’t mostly due to luck. Across all the forecasters, the correlation between performance in one year and performance in the next year is 0.65.24 So we have two good ways to predict how accurate someone will be: Look at their past performance, and look at how well they score on the structural model above. I speculate that these correlations underestimate the true predictability of accuracy, because the forecasters were all unpaid online volunteers, and many of them presumably had random things come up in their life that got in the way of making good predictions—perhaps they have a kid, or get sick, or move to a new job and so stop reading the news for a month, and their accuracy declines.25 Yet still 70% of the superforecasters in one year remained superforecasters in the next. Finally, what about superforecasters in particular? Is there anything to say about what it takes to be in the top 2%? Humble: Reality is infinitely complex. Nondeterministic: Whatever happens is not meant to be and does not have to happen. Intelligent and knowledgeable, with a “Need for Cognition”: Intellectually curious, enjoy puzzles and mental challenges. Pragmatic: Not wedded to any idea or agenda. Analytical: Capable of stepping back from the tip-of-your-nose perspective and considering other views. Dragonfly-eyed: Value diverse views and synthesize them into their own. Probabilistic: Judge using many grades of maybe. Thoughtful updaters: When facts change, they change their minds. Growth mindset: Believe it’s possible to get better. Grit: Determined to keep at it however long it takes. Additionally, there is experimental evidence that superforecasters are less prone to standard cognitive science biases than ordinary people.27 This is particularly exciting because—we can hope—the same sorts of training that help people become superforecasters might also help overcome biases. (1) Triage: Don’t waste time on questions that are “clocklike” where a rule of thumb can get you pretty close to the correct answer, or “cloudlike” where even fancy models can’t beat a dart-throwing chimp. 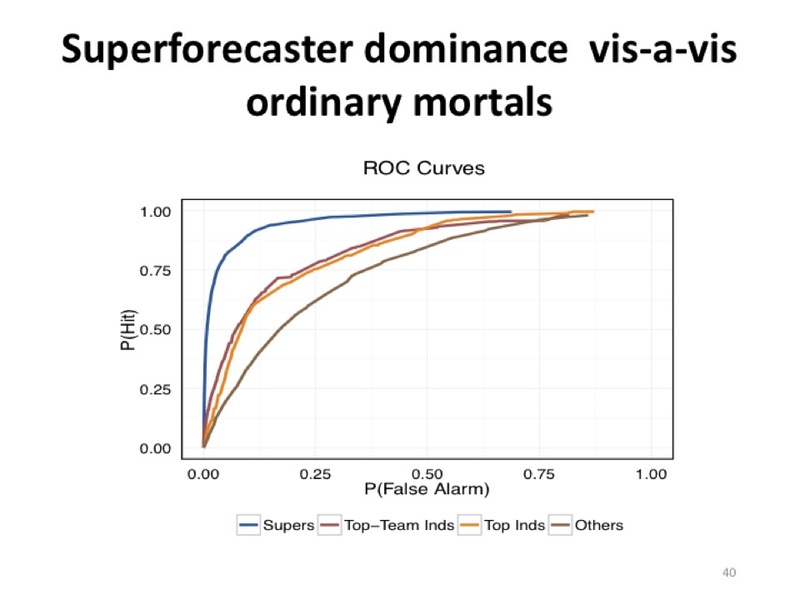 (4) Strike the right balance between under- and overreacting to evidence: “Superforecasters aren’t perfect Bayesian predictors but they are much better than most of us.”35 Usually do many small updates, but occasionally do big updates when the situation calls for it. Take care not to fall for things that seem like good evidence but aren’t; remember to think about P(E|H)/P(E|~H); remember to avoid the base-rate fallacy. (5) Look for the clashing causal forces at work in each problem: This is the “dragonfly eye perspective,” which is where you attempt to do a sort of mental wisdom of the crowds: Have tons of different causal models and aggregate their judgments. Use “Devil’s advocate” reasoning. If you think that P, try hard to convince yourself that not-P. You should find yourself saying “On the one hand… on the other hand… on the third hand…” a lot. (6) Strive to distinguish as many degrees of doubt as the problem permits but no more: Some people criticize the use of exact probabilities (67%! 21%!) as merely a way to pretend you know more than you do. There might be another post on the subject of why credences are better than hedge words like “maybe” and “probably” and “significant chance;” for now, I’ll simply mention that when the authors rounded the superforecaster’s forecasts to the nearest 0.05, their accuracy dropped.36 Superforecasters really were making use of all 101 numbers from 0.00 to 1.00! (7) Strike the right balance between under- and overconfidence, between prudence and decisiveness. (8) Look for the errors behind your mistakes but beware of rearview-mirror hindsight biases. (10) Master the error-balancing bicycle: This one should have been called practice, practice, practice. Tetlock says that reading the news and generating probabilities isn’t enough; you need to actually score your predictions so that you know how wrong you were. (11) Don’t treat commandments as commandments: Tetlock’s point here is simply that you should use your judgment about whether to follow a commandment or not; sometimes they should be overridden. It’s worth mentioning at this point that the advice is given at the end of the book, as a sort of summary, and may make less sense to someone who hasn’t read the book. In particular, Chapter 5 gives a less formal but more helpful recipe for making predictions, with accompanying examples. See the end of this blog post for a summary of this recipe. The previous section summarized Tetlock’s advice for how to make better forecasts; my own summary of the lessons I think we should learn is more concise and comprehensive and can be found at this page. This section goes into detail about one particular, more controversial matter: The importance of the “outside view,” also known as reference class forecasting. This research provides us with strong evidence in favor of this method of making predictions; however, the situation is complicated by Tetlock’s insistence that other methods are useful as well. This section discusses the evidence and attempts to interpret it. Figure 3.2, pulled from Expert Political Judgment, is a gorgeous depiction of some of the main results.41 Tetlock used something very much like a Brier score in this tournament, but he broke it into two components: “Discrimination” and “Calibration.” This graph plots the various experts and algorithms on the axes of discrimination and calibration. Notice in the top right corner the “Formal models” box. I don’t know much about the model used but apparently it was significantly better than all of the humans. This, combined with the fact that simple case-specific trend extrapolations also beat all the humans, is strong evidence for the importance of the outside view. So we should always use the outside view, right? Well, it’s a bit more complicated than that. Tetlock’s advice is to start with the outside view, and then adjust using the inside view.42 He even goes so far as to say that hedgehoggery and storytelling can be valuable when used properly. As the second slide indicates, the idea is that we can sometimes “fight fire with fire” by using some stories to counter other stories. In particular, Tetlock says there has been success using stories about the past—about ways that the world could have gone, but didn’t—to “reconnect us to our past states of ignorance.”48 The superforecaster I interviewed said that it is common practice now on superforecaster forums to have a designated “red team” with the explicit mission of finding counter-arguments to whatever the consensus seems to be. This, I take it, is an example of motivated reasoning being put to good use. That said, the forecasting best practices discovered by this research seem like general truth-finding skills rather than cheap hacks only useful in geopolitics or only useful for near-term predictions. After all, geopolitical questions are themselves a fairly diverse bunch, yet accuracy on some was highly correlated with accuracy on others.52 So despite these limitations I think we should do our best to imitate these best-practices, and that means using the outside view far more than we would naturally be inclined. Sometimes a question can be answered more rigorously if it is first “Fermi-ized,” i.e. broken down into sub-questions for which more rigorous methods can be applied. Next, use the outside view on the sub-questions (and/or the main question, if possible). You may then adjust your estimates using other considerations (‘the inside view’), but do this cautiously. Seek out other perspectives, both on the sub-questions and on how to Fermi-ize the main question. You can also generate other perspectives yourself. Repeat steps 1 – 3 until you hit diminishing returns. Your final prediction should be based on an aggregation of various models, reference classes, other experts, etc. This graph can be found here, the GJP’s list of academic literature on this topic. The graph illustrates approximate relative effects. It will be discussed more in Section 2. This is from my conversation with the superforecaster. They did this so that they could include occasional non-binary questions. They show here that their results are robust to using a logarithmic scoring rule instead. These statistics come from this study. The dataset excludes individuals who signed up but failed to register at least 25 predictions in a given year. The aggregation algorithm was elitist, meaning that it weighted more heavily forecasters with good track-records who had updated their forecasts more often. This description of elitism comes from the webpage. In these slides Tetlock describes the elitism differently: He says it gives weight to higher-IQ, more open-minded forecasters. The extremizing step pushes the aggregated judgment closer to 1 or 0, to make it more confident. The degree to which they extremize depends on how diverse and sophisticated the pool of forecasters is. The academic papers on this topic can be found here and here. Whether extremizing is a good idea is controversial; according to one expert I interviewed, more recent data suggests that the successes of the extremizing algorithm during the forecasting tournament were a fluke. After all, a priori one would expect extremizing to lead to small improvements in accuracy most of the time, but big losses in accuracy some of the time. The best possible Brier score is 0; the Brier score achieved by guessing randomly depends on which version of the score you use and how many possible outcomes each prediction chooses between. For binary predictions, which constituted the bulk of IARPA’s questions, the original version of the Brier score is effectively twice the squared distance from the truth, so always guessing 50% would yield a score of 0.5. This is from this study. The data covers the first two years of the tournament. This is from the same study, as are the two figures. The correlation between average Brier score and how often you were on the right side of 50% was 0.89 (same study), so I think it’s safe to assume the superforecasters were somewhere on the right side of the peak in Figure 2. (I assume they mean being on the right side of 50% correlates with lower Brier scores; the alternative is crazy.) The high proportion of guesses on the right side of 50% is a puzzling fact—doesn’t it suggest that they were poorly calibrated, and that they could improve their scores by extremizing their judgments? I think what’s going on here is that the majority of forecasts made on most questions by superforecasters were highly (>90%) confident, and also almost always correct. Superforecasting p94, emphasis mine. Later, in the edge.org seminar, Tetlock says “In some other ROC curves—receiver operator characteristic curves, from signal detection theory—that Mark Steyvers at UCSD constructed—superforecasters could assign probabilities 400 days out about as well as regular people could about eighty days out.” The quote is accompanied by a graph; unfortunately, it’s hard to interpret. This table is from the same study. “Ravens” is an IQ test, “Numeracy” is a mathematical aptitude test. That said, as Carl Shulman pointed out, the forecasters in this sample were probably above-average IQ, so the correlation between IQ and accuracy in this sample is almost certainly smaller than the “true” correlation in the population at large. See e.g. restriction of range and the Thorndike Correction. “Deliberation time, which was only measured in Year 2, was transformed by a logarithmic function (to reduce tail effects) and averaged over questions. The average length of deliberation time was 3.60 min, and the average number of questions tried throughout the 2-year period was 121 out of 199 (61% of all questions). Correlations between standardized Brier score accuracy and effort were statistically significant for belief updating, … and deliberation time, … but not for number of forecasting questions attempted.” (study) Anecdotally, I spoke to a superforecaster who said that the best of the best typically put a lot of time into it; he spends maybe fifteen minutes each day making predictions but several hours per day reading news, listening to relevant podcasts, etc. “Nonetheless, as we saw in the structural model, and confirm here, the best model uses dispositional, situational, and behavioral variables. The combination produced a multiple correlation of .64.” (study) Yellow ovals are latent dispositional variables, yellow rectangles are observed dispositional variables, pink rectangles are experimentally manipulated situational variables, and green rectangles are observed behavioral variables. If this diagram follows convention, single-headed arrows represent hypothesized causation, whereas the double-headed arrow represents a correlation without any claim being made about causation. Moreover, a quick search through Google Scholar and library.unc.edu turned up nothing of interest. I reached out to Tetlock to ask questions but he hasn’t responded yet. See sections 3.3, 3.5, and 3.6 of this study. This is from Friedman et al (2018), available here. See e.g. page 284 of Superforecasting, and the entirety of chapter 9. This is from this paper. One worry I have about it is that another principle, P, was strongly associated with inaccuracy, but the authors explain this away by saying that “Post-mortem analyses,” the P’s, are naturally done usually after bad forecasts. This makes me wonder if a similar explanation could be given for the success of the C’s: Questions for which a good reference class exists are easier than others. The results and conclusions from this tournament can be found in the resulting book, Expert Political Judgment: How good is it? How can we know? See p242 for a description of the methodology and dates. There are several reasons to worry about this method. For one, it’s not what foxes do, and foxes score better than hedgehogs. Tetlock also says it’s not what superforecasters do. More insightfully, Tetlock says we are biased to assign more probability to more vivid and interesting stories, and as a result it’s easy for your probabilities to sum to much more than 1. Anecdote: I was answering a series of “Probability of extinction due to cause X” questions on Metaculus, and I soon realized that my numbers were going to add up to more than 100%, so I had to adjust them all down systematically to make room for the last few kinds of disaster on the list. If I hadn’t been assigning explicit probabilities, I wouldn’t have noticed the error. And if I hadn’t gone through the whole list of possibilities, I would have come away with an unjustifiably high credence in the few I had considered. Superforecasting p266. This is reminiscent of Yudkowsky’s perspective on what is essentially this same debate. The superforecaster I interviewed speculated that predicting things like the continued drop in price of computing hardware or solar panels is fairly easy, but that predicting the appearance of new technologies is very difficult. Tetlock has ideas for how to handle longer-term, nebulous questions. He calls it “Bayesian Question Clustering.” (Superforecasting 263) The idea is to take the question you really want to answer and look for more precise questions that are evidentially relevant to the question you care about. Tetlock intends to test the effectiveness of this idea in future research. I haven’t found this said explicitly, but I infer this from Doug Lorch, the best superforecaster in Year 2, beating the control group by at least 60% when the GJP beat the control group by 78%. (Superforecasting 93, 18) That said, page 72 seems to say that in Year 2 exactly one person—Doug Lorch—managed to beat the aggregation algorithm. This is almost a contradiction; I’m not sure what to make of it. At any rate, it seems that the aggregation algorithm pretty reliably does better than the superforecasters in general, even if occasionally one of them beats it. This is on page 304. Another example on 313. For more on these, see this page.